Call For Poster Presentations - We have a number of excellent presentations in store for this years conference. There's still room for more Posters. In order to have your poster included in the program, the abstract is due by September 14, 2016. Otherwise, the deadline is September 23, 2016. Exhibitor Registration - Exhibitor and sponsor registration is now open. Click HERE to register online. 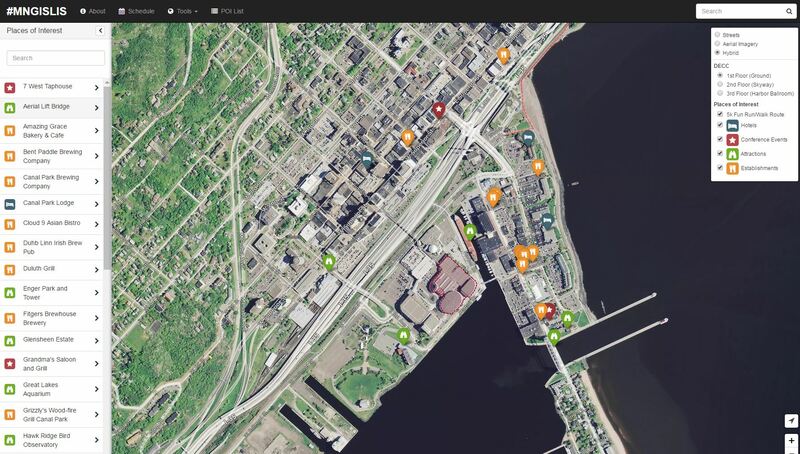 The *official* conference map for the 26th Annual Conference in Duluth, Minnesota. The map was made with mobile design in mind, try it on your phone or tablet! Sessions Presentations - The submission deadline for Poster presentations is September 23, 2016. In order to be included in the program, the deadline is September 14, 2016. To submit an abstract for a poster, please click HERE! Chose from the general member poster display or the "open student poster competition". Please note: the "open student" poster contest is NOT the 2-yr college Scholarship Contest. Any enrolled student may participate, there is one winner of this contest. 17 half-day workshops will be offered on Wednesday. Workshop participants can select from a variety of topics, ranging from general introductory issues to specialized technical-focused topics. • Open Data Portals: What, Why, How? Once you’ve arrived in town, join your colleagues for networking and great brews at 7 West Taphouse, located at 7 W Superior Street, which is within walking distance from the local hotels. 7 West Taphouse is a laid back bar and restaurant with a large beer selection and variety of food options. After a long day of workshops, stop by the Geolounge for some drinks and food. This event will be open to all, with a special welcome to our educator attendees. After the Geolounge, feel free to wander over to Grandma’s Saloon, 522 S Lake Ave, for a welcome reception with food and drinks and more networking opportunities. Once the sessions are over, be sure to stop by the vendor reception in the DECC exhibit hall. Afterward, join us for the conference social at the Holiday Inn, located in downtown Duluth. The festivities include a craft beer tasting event, featuring craft brews from across the Northland region! The conference may be over, but the weekend is just beginning in Duluth! Feel free to explore and visit one of the many scenic sites, enjoy the craft brews, restaurants and entertainment in Canal Park or downtown. Don’t forget your MN GIS/LIS Conference discount card! The vendor exhibit hall will showcase a redesigned layout and highlight the latest GIS-related hardware and software, GIS products and services. The exhibit hall will be open Thursday and Friday. Conference registration includes admission to the Exhibitors’ Reception on Thursday evening. Hors d’oeuvres and refreshments will be served and a cash bar will be available. The reception will be held in the exhibit hall, providing another opportunity for attendees to visit conference exhibitors. Registration information and workshop descriptions will be available in July. 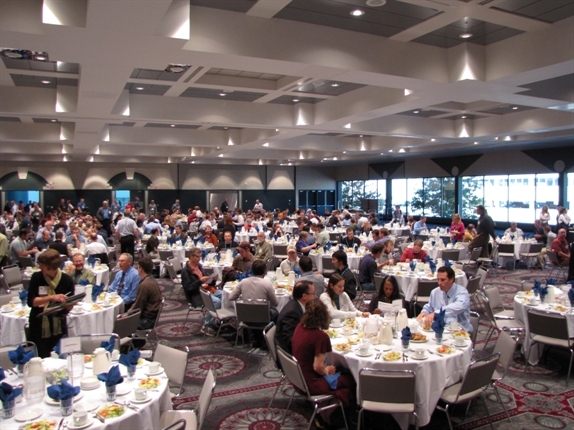 Conference registration includes lunches, evening receptions and all refreshment breaks. The Consortium will once again have a 5K Fun Run/Walk event on the Friday morning (October 28, 2016) of the conference. We’ll meet at 6:00 AM for a ‘brisk jaunt’ along the Lakewalk on the shore of Lake Superior. The route will be “out and back” with guide signs placed for key distances and at the 2.5 km “turn-around” point. Event registration will be limited to 50 participants (to comply with our event permit issued by the City of Duluth). Event participants will receive a high-performance commemorative event t-shirt. More details will be available soon from the Consortium website. Session and poster presenters will receive a $45 discount from the full conference rate if payment is received by October 7. Official Web Map - Visit the *official* conference map. View the conference schedule, check out workshop and session offerings at the DECC, check out places to visit while in Duluth, and much more! The map is also mobile friendly - check it out on your phone or tablet device!